When scanning down Signatures, I get the initial difficulty red bubble, but once I have scanned a sig in range once, I never see this bubble. Previously I would use the size of this bubble to determine the best scan radius of my probing, without this I have to guess. It has slowed down my ability to scan significantly. You screwed up the Providence and Ark again: There are now too many bright (in case of the Providence) and too many red parts (in case of the Ark) on the underside of the ships. The base color of Amarr ships is black, and you removed a lot of that base color and replaced it with tacky bright/red parts. That does not make the ship look any better. Another problem with the D-scan, if you want to manually change the dscan range by putting in the number, you are unable to go double digits. For example if you want to do 12 AU, it will go to 1.0, 14 goes 1.0 etc etc.. If you want to do 1.9 it goes to 1.1. So something is definitely messed up with it now. Sure I can scroll yay, but I have never ever used the scrollwheel to change the range. I'm honestly a bit amazed that you've managed to screw up the Directional Scanner so much when it was so great before this entire update. I look forward to when it works again. I love the new changes. dscan is great, no issues with it and the new scanning window is far better than has been before so kudos there. With the New Dscan, the Minimum Setting in Au is 0, Why? 0 is literally useless. The only one has the minimum of like 100k which was good for checking if people where in a gated site. Also the KM slider on Dscan is a bit stupid. The minimum is 10KM, thats on grid, pretty sure you don't need to use Dscan if something is 10Km from you. The next size up is like 147Mil which is a huge jump. Better off with something like 100k KM and 1KK KM and then go up from there. 'Improved' Dscan and probe scan is plain broken and far from ready for release, roll back please and make it work properly. I get what you are trying here and I don't disagree, but please at least let people who know how to use this functionality quality check and do not just have the "let's add sounds to everything and delay the actual function of the feature while it plays.. and oh let's just make it look cool for the hell of it" newbro developers run with it. If this was supervised by a senior developer, who I'd expect understands the game, his position should be reconsidered. This implementation is not ready, not even close. Still no fix to dscan manual inputting. The "Black Squares" Plaque is still in place, if post processing is activated. 4) Sometimes when I'm trying to move the cube, I accidentally left click the signature and very nice and useless popup menu appears. My suggestion is to remove signature menu on left click at all. Cause you can open almost the same menu using right click. Many people use the radial menu. You can disable it or change key, or set bigger delay for activation. For me 4) is a rather tedious inconvenience too. Perhaps the radial menu could be disabled just when overlapping with the probe sphere? The useful feature of clicking-and-dragging scan probe spheres to resize them from the system map was removed. Supposedly people were annoyed that they would click for some other reason and end-up resizing them. However, a new feature was added that allows the player to double-click the system map to toggle between orthogonal views. Often, a misclick when trying to double-click on a system feature results in the system map camera changing. By the logic of removing the click-and-drag resizing, the double-click orthogonal view change should not have been added. However, the double-click camera change is actually good, the click-and-drag probe resize was actually good, and people just need to click in the correct place. If you want to continue in the logic of not allowing players to click-and-drag in the wrong place, accidentally messing something up for themselves, you should also take a look at the Planet View interface. You might as well not allow the player to rotate the planet by clicking-and-dragging. Often the player will attempt to click-and-drag an extractor head and end up rotating the planet. By the new logic, the planet should only rotate in one angle if "alt" is held and in the other angle if "ctrl" is held. I am also running into an inordinate amount of lag when I am hacking a container, especially when I am killing the core. I have had this issue for a long time. I suspect memory leak. What happens to your FPS? I was going from ~90fps before the hack to sub 30 fps during the hacking minigame and then as soon as the game closes I'm back to full FPS again. Yeah, I saw it happen before this update, but it was not nearly as pronounced. However, this patch came about the same time as several Microsoft patches and it could have been some patching being done in the background that I missed. A friend of mine and I have been feeding pretty steady bug feedback to CCP on this issue. 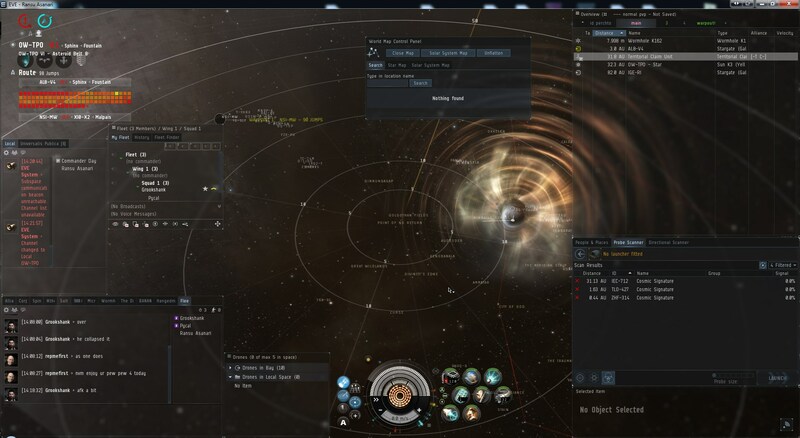 CCP Paradox was trying to repo it but I don't know if he every was able to. Here is what I'm seeing when it happens. This was with a pair of SLI 660gtx cards an I still occasionally have it happen since upgrading to a 1070 8gb card. It doesn't always occur, normally though it happens after a few hours of game play. D-scan now doesn't update upon changing system. Previously it did. If target locking in pvp, the screen freezes about 3-4 seconds. Corpmates the same. So, at the Moment unplayeble..
You launch the update whiout tests and Voila! Great disaster! The game to the carriers is now a Joke. The Fighters die Soo easy when they stop Instapop! If the NPC carrier appear, you lost 2 heavy fighters in a row in MOVEMENT! How the hell you put that update whiout test it?!?!?!? I had all Supercarrier skills at 5 and you lost fighters each 2 anomalies! that is stupid and unfair to the capital pilots! I spend 2 years of my Life to can pilot and Hel and now is Uselles! and you don't read the forums! That is very irespectful to the EvE players! Before the patch, the Fighters had a stupid shield defense and Hp, the Drones had Much more... and now I don't have nice words to describe how you convert that in a joke! Can we please have the tooltip for the launcher moved to the empty space to the right of it, so it does not block stacked windows? Same here. Also, the backspace and . (decimal point) keys are not working when changing scan range. How do you recover your probes in the new probe window if you lost them? I just had a disconnect and can't reconnect to my probes. That's a simple button press in the old scanner system, how does it work in the new window? So far it doesn't look like that essential feature was included at all. I like the new DSCAN changes. The color change is fine, and I don't seem to be fighting with the camera as much (so some bugs fixed there). I'll probably have more feedback on this as I use the new DSCAN interface to scan down targets in anomalies. It has to work fast! I'm glad the Probe Scanner and Directional Scanner windows can still be docked in the normal window interface. I like to be able to have them as tabbed windows and switch between them quickly. I'm not a fan of the moves the buttons have received. Please move the DSCAN and Probe Analyze buttons back up to the top left side of the window. I've done a bad MSPaint illustration to show how they should be: http://i.imgur.com/hFJAoc7.png. Basically we got used to this location for the longest time, and now we have to re-learn muscle memory in the opposite diagonal location. For what reason!? Please change it back. This really isn't a bug, but I'll log an EBR if it's needed. Prior to the patch, when you clicked on one signature in the signature list, it would only show you that one signature. This made it relatively easy to scan down without noise around the signature. Now, there's a less defined version of ALL signatures always in space in the probe window. Please put it back the way it was. Logged EBR-115365 - Scanning Interface - Clicking on a single signature doesn't make all other signatures disappear while scanning. I don't mind the new icons as much for when a signature gets scanned down partially. The progress rings are just TOO DAMN LARGE however. Neither of them resize when you zoom in/out however. It really makes it difficult to scan a signature to 100% once it's just a dot. I've logged this bug: EBR-115364 - Signature icon and progress ring don't resize as you zoom in/out. I'm not sure what the deal is with the nebula inside the scanning interface. It's not pure black - it looks like a hazy green/black with stripes. There's a note here about "Current nebulae in solar system map" but no update with an explanation. I've logged EBR-114813 Scanning Interface - Not black when fullscreen. It's already been closed with no explanation. Please comment or take a look at the bugreport. Is it possible to have a quick toggle " minimize and maximize" button for the docked scan window? I miss the old probe activation. I keep thinking my mouse button didn't trigger the refresh due to th delay in initiating/moving/scanning on the new probe interface. 1.Undock and the Directional Scanner and Probe Scanner panels from the solar system map. 2.Redock the Directional Scanner and Probe Scanner panels with the solar system map. 3.Close the solar system map with the docked panels. What the **** does that even mean??? "Undock the directional scanner", "solar system map with the docked panels". This is apparently from some other game since in the eve online I play I typically undock my ships, not my maps. Also I have no idea what these "docked panels" are. Could anybody clarify this to me in clear english? Manually writing in range in the Directional Scanner is still broken. 9.9 defaults to 9, trying to write 11 or 12 gets you 1.1 or 1.0 or whatever. This has been broken since the introduction of 119.3.
the whole game is laggy now. I'm playing on a top-end skylake with nvidia m4000m card, SSD, 32GB of ram, win7x64.. used to have two clients running max graphics with *everything* in the visible brackets, with 4 monitors in HD+, but now can barely manage minimal graphics settings and it *still* jutters, lags "seconds" (which means I'm avoiding combat!) and generally takes "forever" to load, even when I yank all of the external monitors and try flipping between clients on the one screen. Process explorer shows each client taking a minimum of 25% of my CPU.. both clients on the previous build barely showed up. As a point of reference, watching the battle of the last keepstar to die was NOT a challenge to this hardware under the previous build, again with all details to maximum and all brackets on. Furthermore the new shaders don't look as nice as the old ones did (imho). the "brightness" setting is rather odd for a game like this.. it used to be about perfect.. now it seems to never be quite right. I have colleagues who are color blind, I think you should have someone like that on-staff or consultation to set your colors. New probe wobble sound is so long, it prevents scanning until it completes, even if the probes only make a minor movement adjust. the new d-scan bubble around the ship is full of unnecessary angles, lines and shapes that distract from the game-play. Very immersive play.. beware "fixing" what isn't "broken"